Supreme Air provides Air Conditioning, Heating and Plumbing Services, Repair, Installation, Maintenance, and Tune Up in Cockeysville, MD and surrounding areas. I cleaned the condensate pan and drain lines and ran hot water to flush the debris and make sure it drained properly without leaks. I checked the electrical wiring and electrical systems, all are within specification. The washable filter was very clean. I operated the unit on second stage cooling mode and while I had 20 degree delta temperature across the coil, it was slow to reach it so I put my gauges on the system. While putting my gauges on I noticed refrigerant oils around the true suction valve stem. I tried tightening but I was picking up refrigerant using leak detector. I called the customer and proceeded to replace all 3 valve stems, leak check those and the braze joints and confirmed no leaks. I added 2lv 8oz of r410a refrigerant which increased my suction pressure to well above freezing, when converted to temperature. I charged until I had 13 degrees subcooling, normal Superheat and still maintaining 20+ degree delta temperatures across the coil. Unit operating normal. Customer he smelled burnt On arrival set units to call for cooling measured supply and return air temp measured voltage and amps inspected electrical connections checked drain and cleaned checked filters and replaced also call for heat measured supply and return air temp measured voltage and amps inspected electrical connections checked condenser unit checked electrical connections checked voltage and amps checked capacitor checked freon recommendation unit needs duct cleaning.Is nothing burning unit tested unit operating normal at this time. Also customer sign new SA I waved the trip fee and diagnostic fee collected. Full maintenance on 03/12/19 on arrival set units to call for heat checked condenser unit checked electrical connections checked voltage and amps inspected measured INT and LVG temp checked condenser drain also call for cooling condenser checked electrical connections checked voltage and amps checked filters and replaced measured supply and return air temp checked condenser drain and cleaned tested units operating normal at this time. On arrival found unit not operating due to a defective inducer motor and limit switch. Customer wants to replace indoor and outdoor unit. Turned system on and checked operations . Took a video of the blower while running to show costumer. There was no noise and everything working . Can hear rattling from unit in conference area . Unit is right above and the disconnect and doors rattle when unit is running from vibrations. I put foam behind disconnect and I screwed cabinet doors tight to limit sound . Unit is directly above so costumer will hear some noise from unit . I replaced the compressor and installed a new filter drier. I flushed system with dry nitrogen. I used 250 psi of nitrogen as a leak test and it held for ten minutes. I pulled into a deep vacuum and added 15.77 lbs factory charge plus an additional 3lb 2 oz to account for the very long lineset. Operating pressures matched data plate and the unit went into second stage operation and defrost cycle normally. Unit operating normal. Customer paid the balance $1,183.50 with a check today. The previous deposit will zero out the invoice. Upon arrival I was told back right area unit not heating. Went to thermostat and found it calling for aux heat but unit not running at all. Found 3amp fuse blown. Replaced and tested system. Found unit not tripping fuse but reading voltage on thermostat wire that should not have any voltage. Went to condenser and found thermostat wires (G and E) touching each other, bleeding voltage and potentially blew fuse. Used wire nuts to cap each wire thatâ€™s being fed voltage. Wires now not reading voltage unless called for. Tested defrost mode, heat, and aux heat. Unit operating normal and satisfied thermostat at 72. Replaced blower motor assembly with shaft and barrings . Also replaced belt and started and tested system . System is operating properly , supply air 117 and return air 72 . Blower motor pulling 3.1 amps rated for 5.4 . 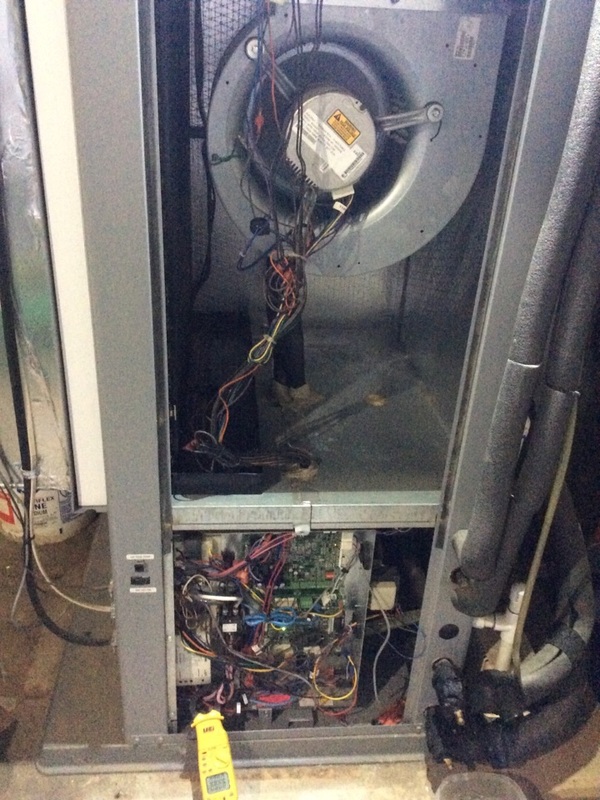 On arrival explained the customer to turn on the unit can be more damage customer agreed turn on the unit checked electrical connections checked supply and return air temp. Unit running at this time. Found unit making a grinding noise / banging when I got up on roof . Took off my blower access door and found that the Blower housing is shaking . The wheel is ginding when it turns . Recommend replacing blower assembly with the shaft due to rust . Also would need to replace the belt which is an A52. Left unit off to prevent any damage being done to the motor . 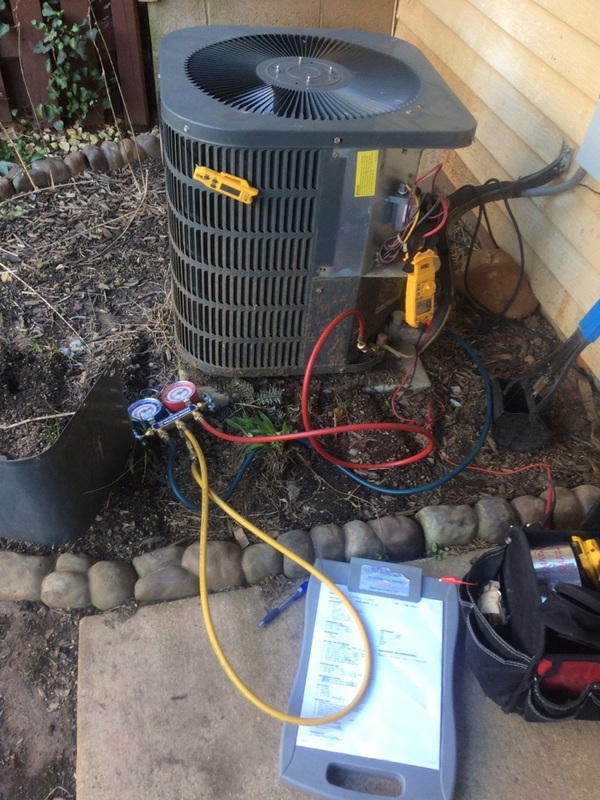 Fall pm on 12/26/18 On arrival set units to call for heat measured supply and return air temp measured voltage and amps inspected electrical connections checked drain and cleaned checked filters recommended replaced air filter units operating normal at this time. There were two separate issues. 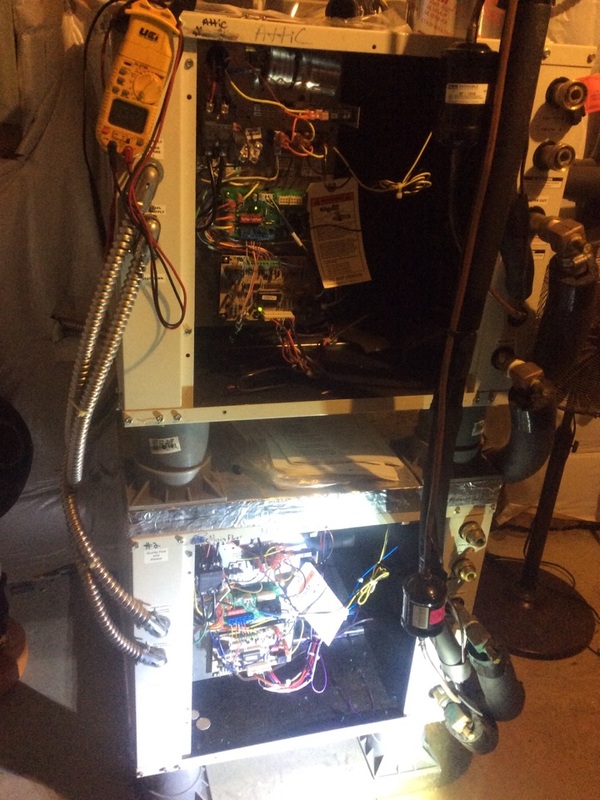 The first had to do with the upstairs heat pump flashing error code 87 (second stage compressor operation failed to initiate.) The same error was flashing at the outdoor unit. I pulled second stage wire harness from the compressor and reset the system and measured 24 volts dc. The compressor amp draw increased when I installed the harness to the compressor. So the compressor is operating normal now but I informed the customer that if the error occurred s again that the fault is in the compressor itself and to fix would require relacing the compressor or the unit itself. The second issue was a noise issue which I traced to unit #4 in the crawl space. I lowered the blower speed by one setting and this stopped the vibration that was ultimately being created by the electronic air cleaner cells rattling inside the housing. I repositioned them as well. For this I charged the generic task and I made an estimate for compressor replacement.